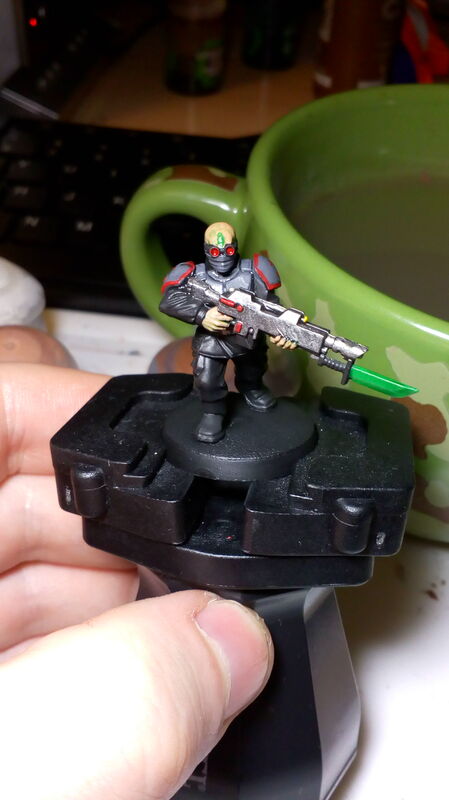 The Children of Kane Cometh - Brotherhood Of Nod Themed GSC! "On the Hive World of Tiberius IV a strange green crystal can be found. The crystal is believed to be xenos in origin the Imperial forces on the planet have decreed it be destroyed, as the Tiberius Crystal spreads quickly, is tough to eradicate and causes rampant mutations. However, not all agree with this plan. Many people of power believe that it has great potential, that it can be used as a power source as well as being rich in valuable minerals. Illegal Mining operations have been taking place for a long time on the planet and there is a well established black market. The people used in the mining operations are often the downtrodden and abused. They are forced to work in the Tiberius mines and most die from exposure to the toxic crystal or mutate into horrible beasts. 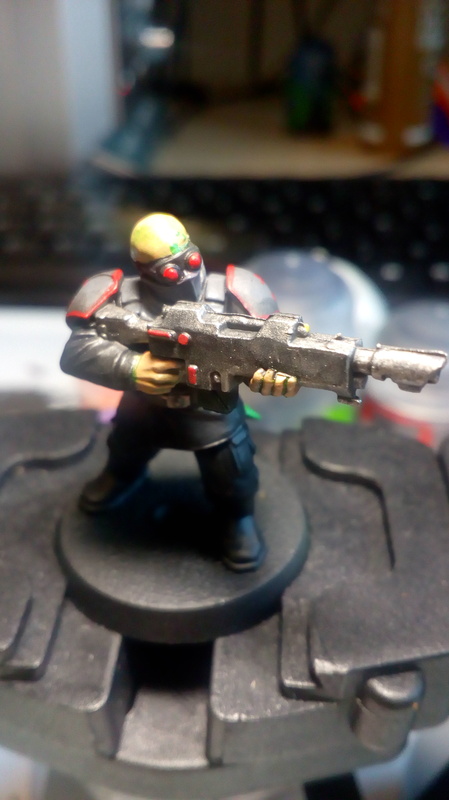 It is in this community that the Genestealer Cult has been established. 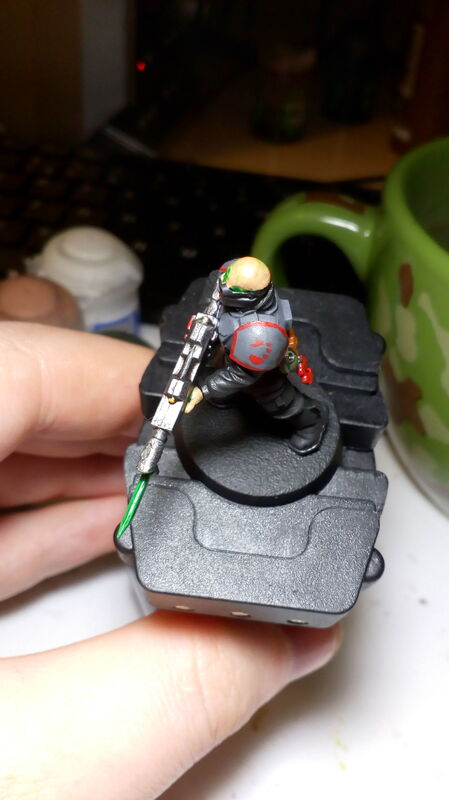 Several years ago, a single genestealer landed on Tiberius IV. As per usual it quickly infiltrated the lower classes of society and began infecting the population, beginning to evolve into a patriarch. It didn't take long for the creature to learn of the Tiberius crystal and with alien cunning it began to unlock the secrets of the great green crystal. 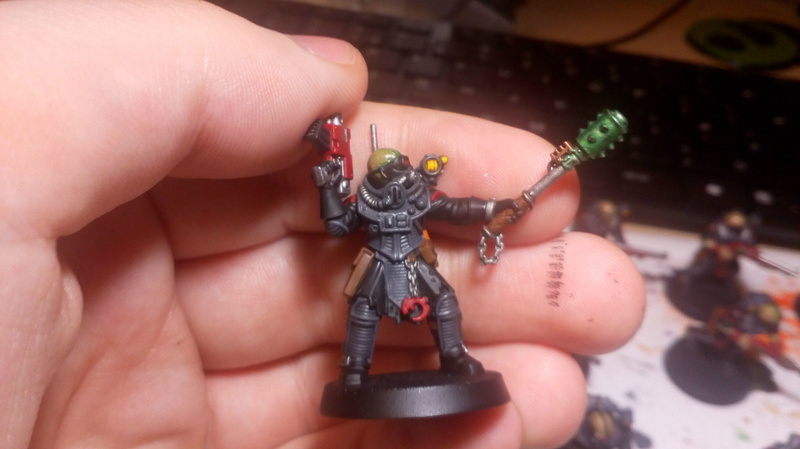 As the cult began to grow it became known simply as The Brotherhood, a religious group who gives help to those working in the mines, providing a small glimmer of hope in an otherwise bleak existence. This appearance has allowed for the cult to grow strong and quickly, as many miners will do anything to improve their meager lifestyle, as well as a chance to strike back against their oppressors one day. The Brotherhood has been able to create many technologies and weapons based on Tiberius. Instead of flamers they use Liquid Tiberius Spewers. 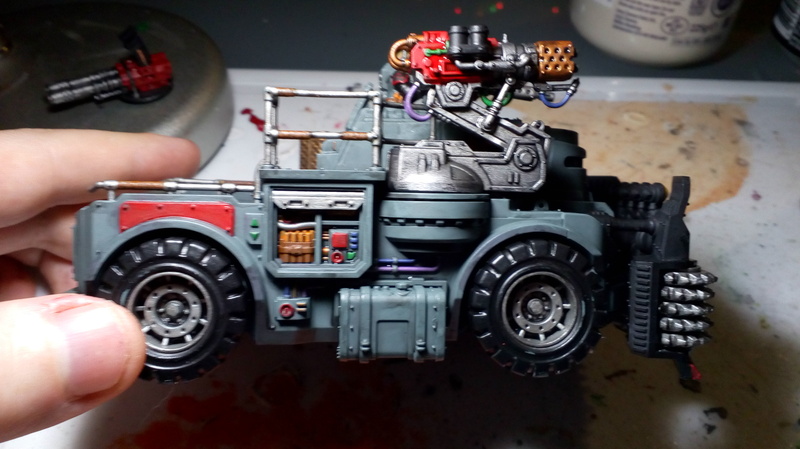 Tiberius power cells can used to enhance traditional mining lasers, or power the vehicles of the cult. Green crystal knifes that are light as a feather yet cut through flesh and bone with ease. 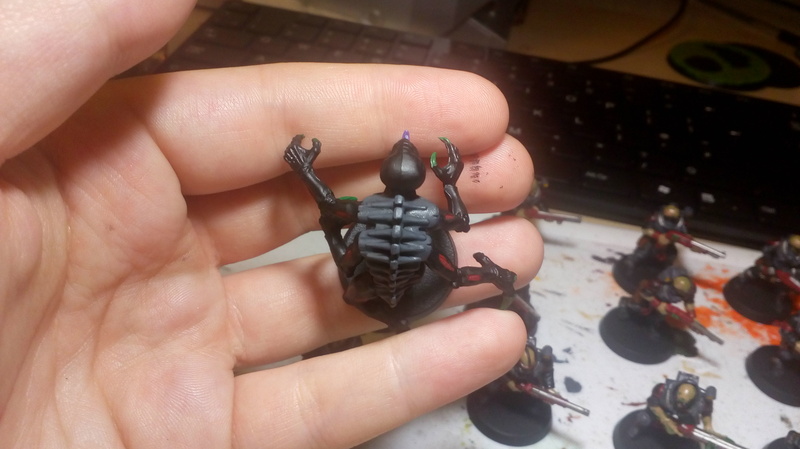 With an almost limitless supply of crystal to work with, The Brotherhood is expanding quickly and soon it will be time to rise..."
I plan on only using units from the Genestealer Cult army, no Tyranid or Guard allies. There are 2 main reasons for this, firstly I think every faction can stand on its own two feet and secondly it doesn't really fit with the fluff that I am going for. 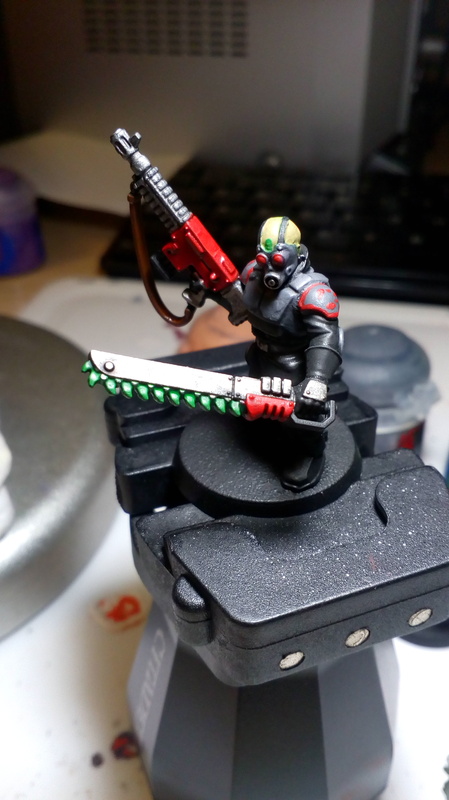 In terms of paint scheme, I already have painted a few guys I am going for a Grey/Black/Red scheme. This is because Tiberian Sun is my favorite C&C game that was the overall scheme for the Nod forces. Mordian I love everything about this!!! Lovely fluff and marvelous color scheme!. I want to see more <3. Cheers whit my four arms. I think you're really missing out by not having guard allies in there. You both make some great suggestions. However, I already have a huge IG force. If needed to I can "borrow" those units from my IG. 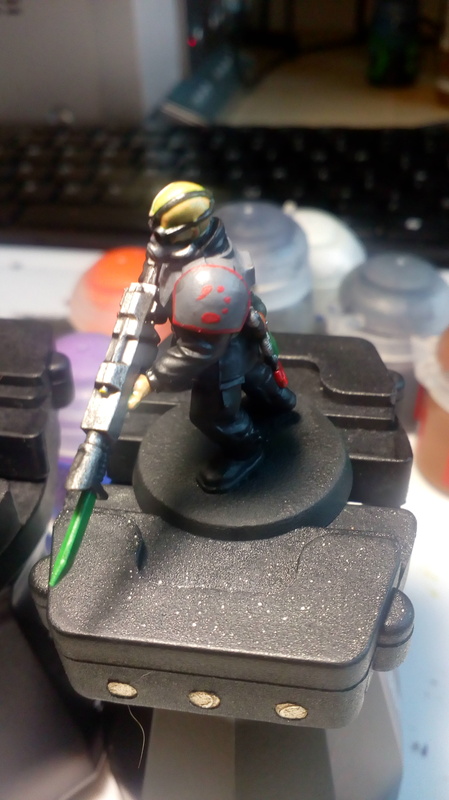 I am really keen on building a pure Cult force, at least for now Maybe in the future if I expand on the army to a big extent. 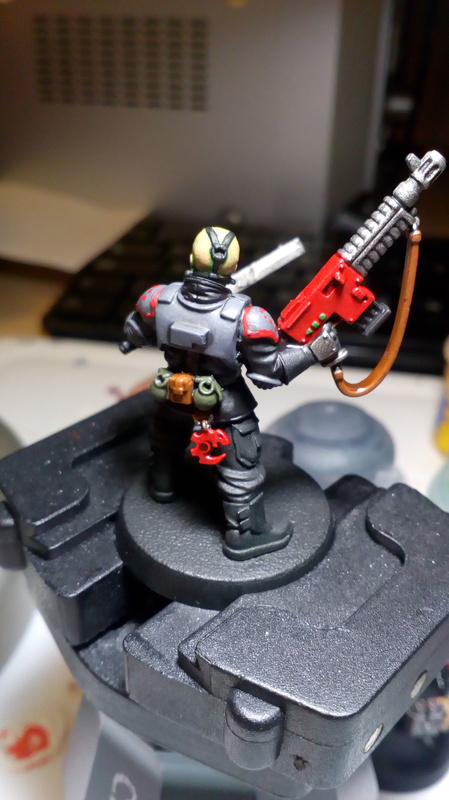 They aim is to really focus and get the last few models painted this week, then treat myself with painting a Primus! The cult continues to grow! 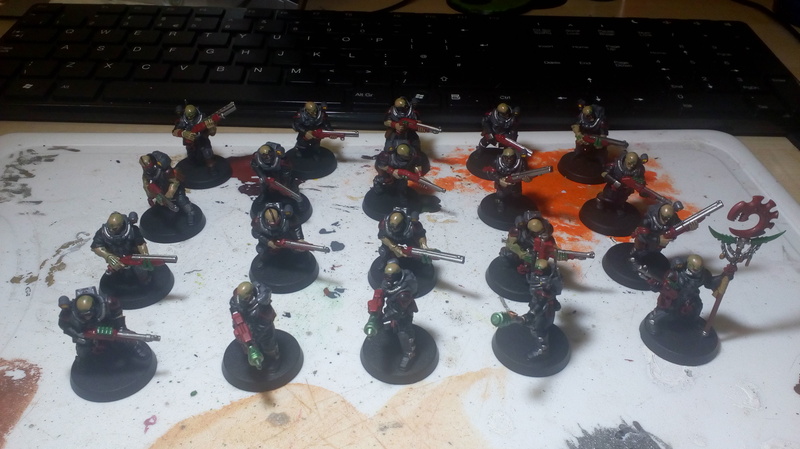 I have completely finished the first 20 man blob squad and have begun work on my second. 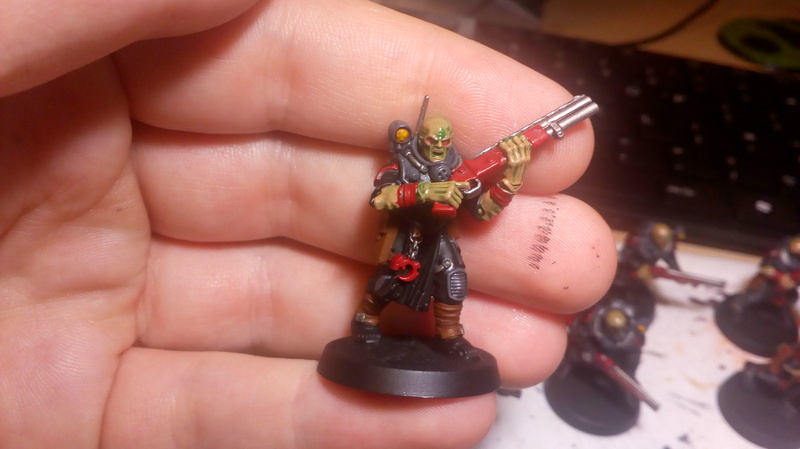 This second mob is armed with shotguns and Liquid Tiberius Spewers (aka flamers). 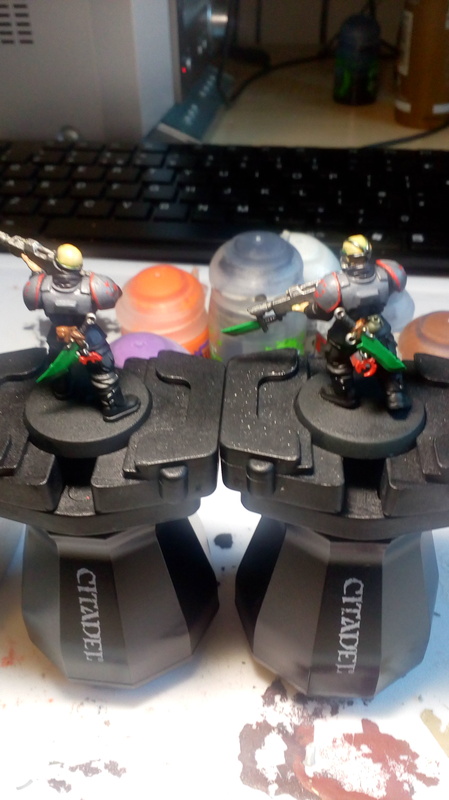 I have based them and done the body armour on all of them, which I find is one of the most time consuming parts of the models. 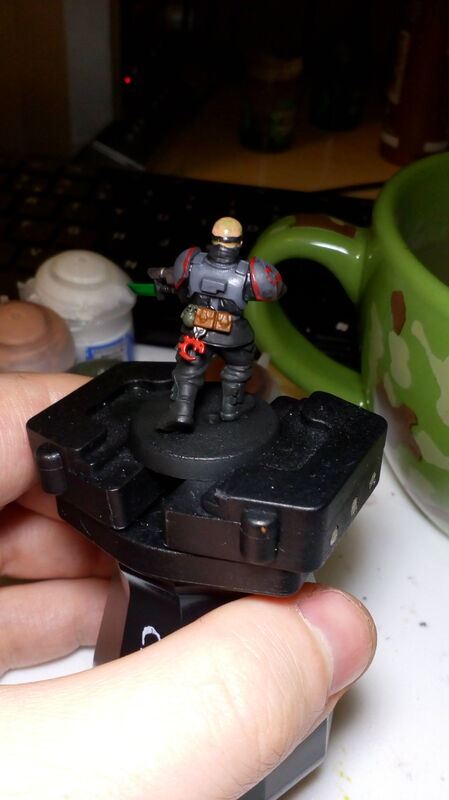 Pictures to come, I plan on finishing the squad this week. 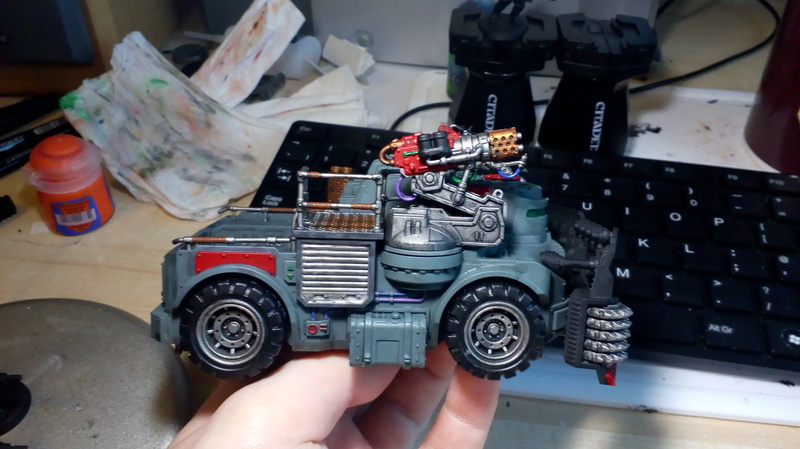 Once they are done it will be time to work on the Stealers or Trucks. So, presumably there will fortifications for this army? 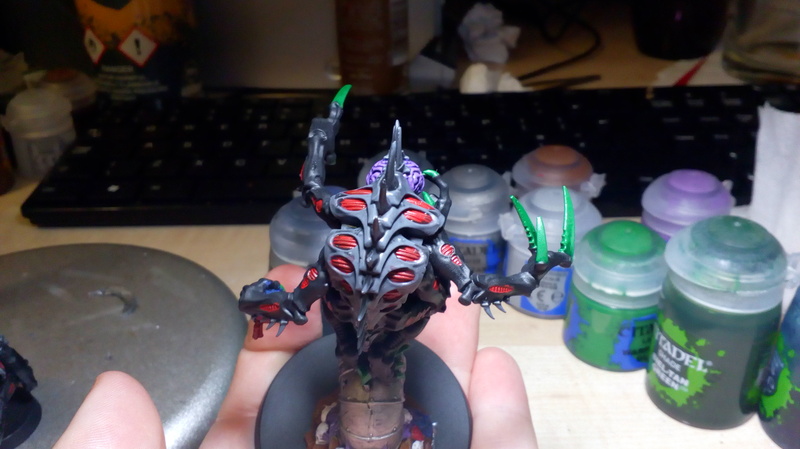 You’ve got to do a plasma obliterator as an obelisk, surely? I do a blog. It has battle reports and stuff on it. Oooo thats a really cool idea! I will need to think about that! It has been many days since I last updated, but fear not for the cult has not been idle. 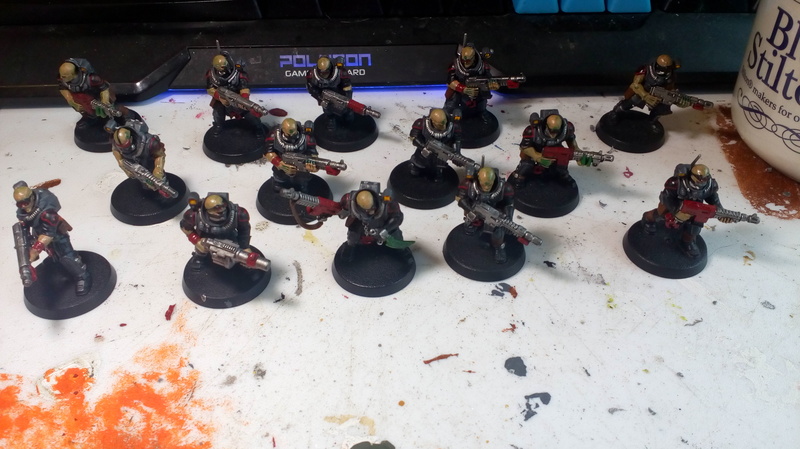 I had some time off and made a big effort to get my cult forces painted. 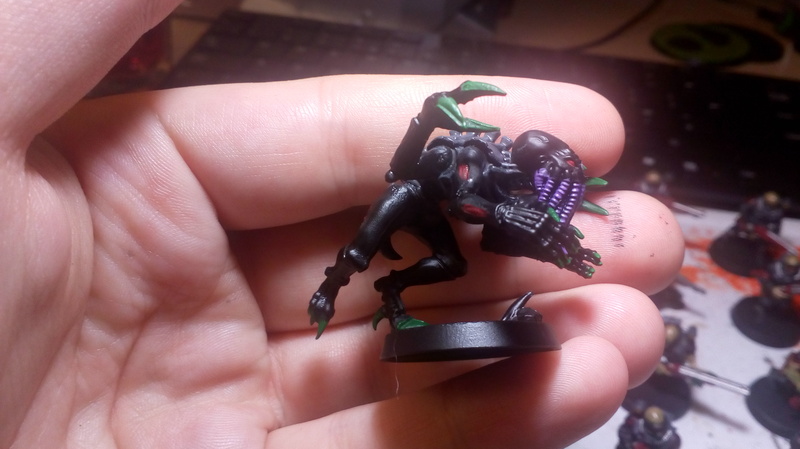 I was able to get another 20 man Neophyte blob and a 24 genestealers painted! 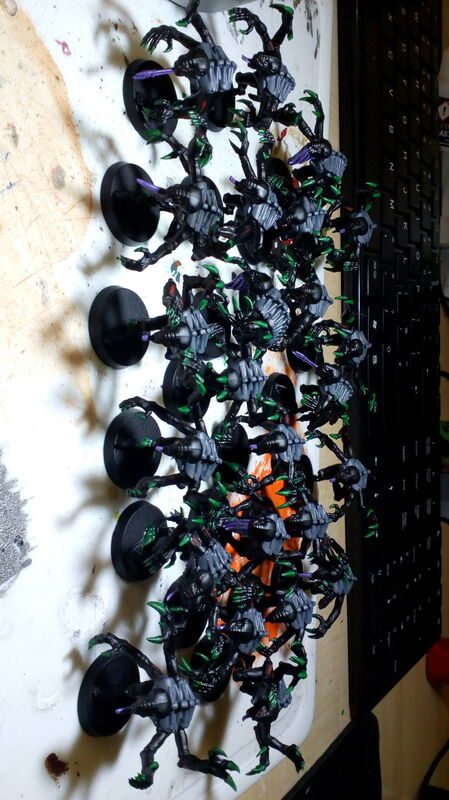 That means I am about half way through my Infantry I also got 20 more neos and my rockgrinders base coasted. My wallet has also taken a pounding, but no sacrifice is to great if it furthers The Brotherhoods plans. 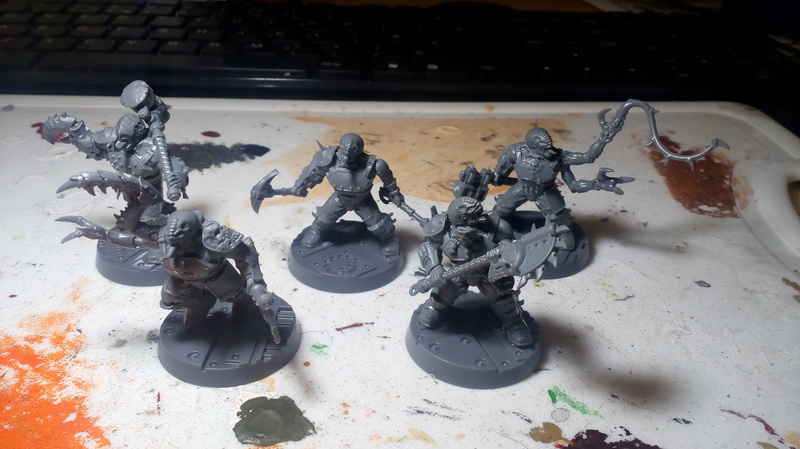 I have bought 24 Acolytes, an Abominant and 10 Goliath gangers. The Goliaths will be converted into Aberrants. I actually am not a huge fan of the new models and also they are quite expensive to get a hold off. 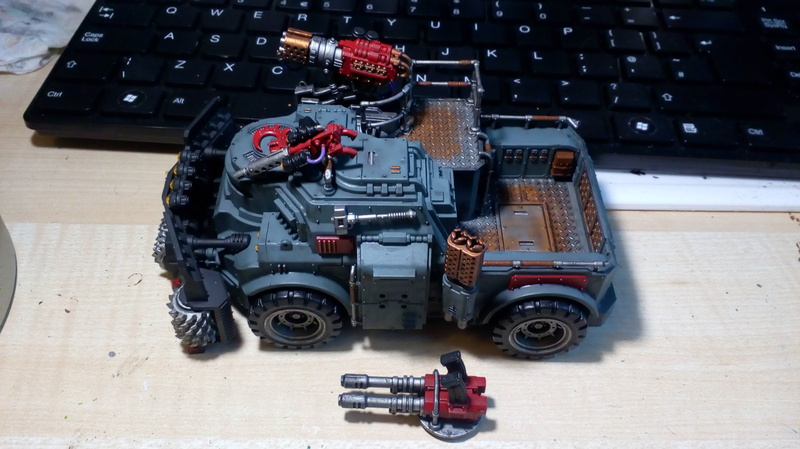 I have seen Goliaths converted before and it looked really good. Besides I have loads of bits left over that I am keen to use! As always, pictures below for loyal members of the Brotherhood. 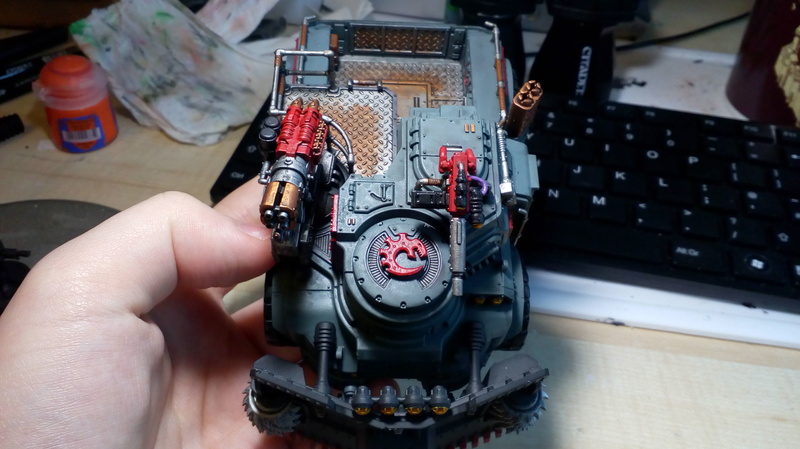 Edited by Mordian Glory, 05 November 2018 - 10:13 AM. The Brotherhood has continued to grow. We have been focusing on adding some armour busting ability to our cult. 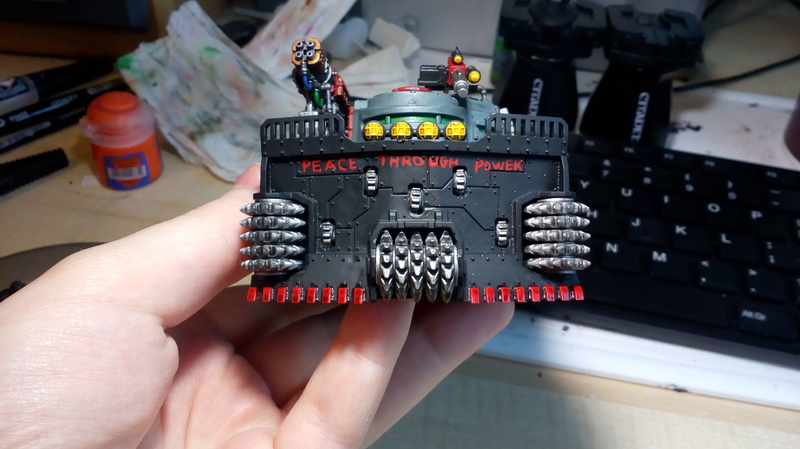 To that end I have scratch built some Aberrants and painted one of my Goliath Rockgrinders. I think that's a very clever idea for the Abberants, and they came out great! Your Goliath looks amazing as well, I just printed mine and am excited to get going on it. Happy New Year Followers of Kane! I also played 3 games with the Brotherhood over the last 2-3 weeks and I won every one I played Dark Angels, Grey Knights and Imperial Knights. All the lists were pretty good (even the GK one) and I was pretty proud of the cultists for beating them! 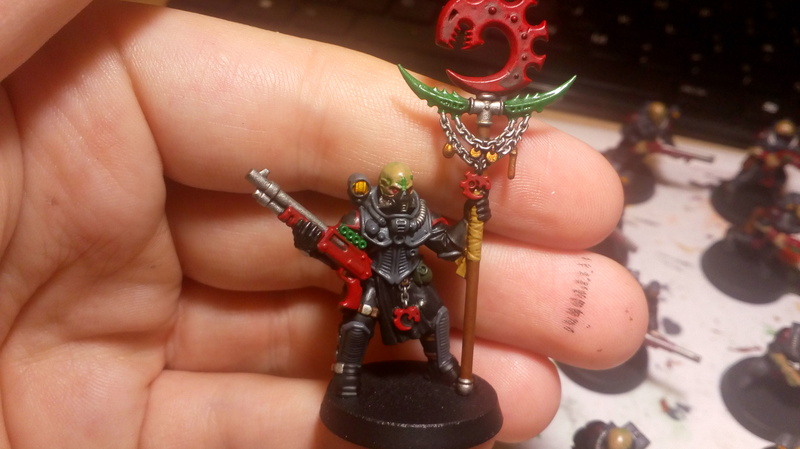 In terms of painting I finished my Patriarch (I named him CABAL) and got 13 neos and 7 acolytes 95% completed, just need to do the washes on them. As always, pictures below for the true believers. Deeply love your theme - GSC and Nod have a ton in common - and the scorpion tail sigil is just so perfectly suited. Keep up the good work! The Brotherhood has spent many days infiltrating the civilian population of Tiberius IV. Whilst the scum of the mining communities made for a steady supply of followers, they made poor soldiers. 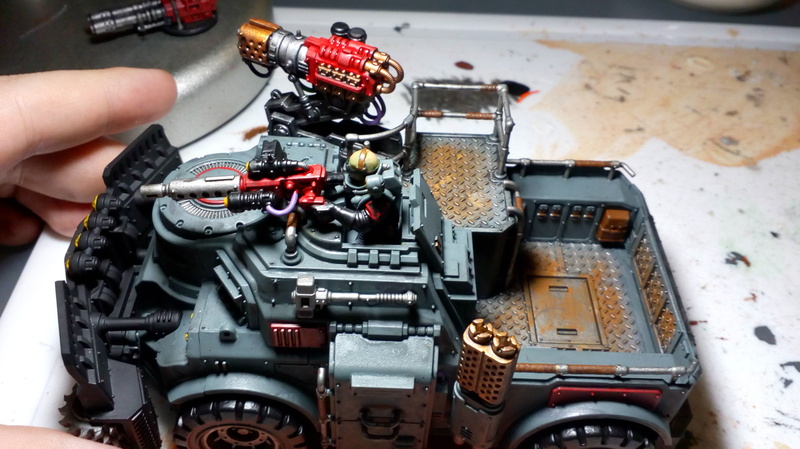 After having to make do with mining equipment, autoguns and Improvised Fighting Vehicles the cult has grown to the point were it needs military grade equipment to enact the next stage in its plans. 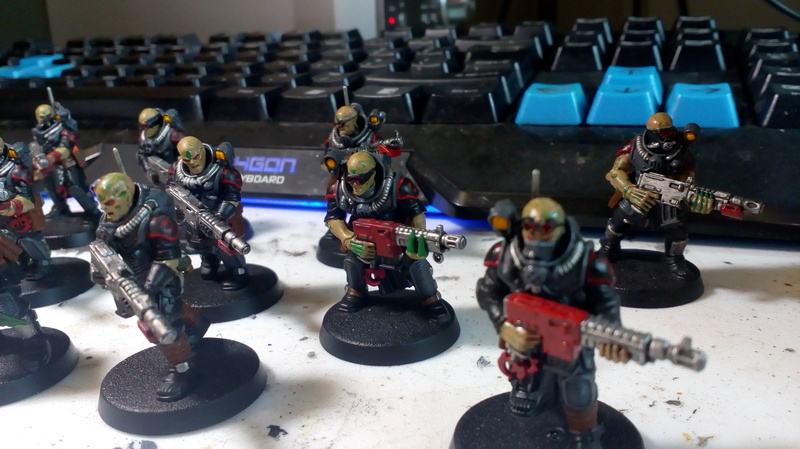 However, the forces of the Imperium are ever vigilant and infiltrating the PDF and Guard regiments has proven difficult. Of course The Brotherhood will continue to try. Fortunately, the followers of the green crystal have found a rather elegant solution to their problem. There is a well established organised crime syndicate on the planet, which came about due to those in corrupt officials in power demanding their cut from the mining of the illegal Tiberius crystal. The criminal network has links within the manufactorums which make equipment for the local defense forces. The Brotherhood, thanks its monopoly on the Tiberius crystal, has forged close ties with these criminals and has begun infecting and infiltrating all levels of this network. 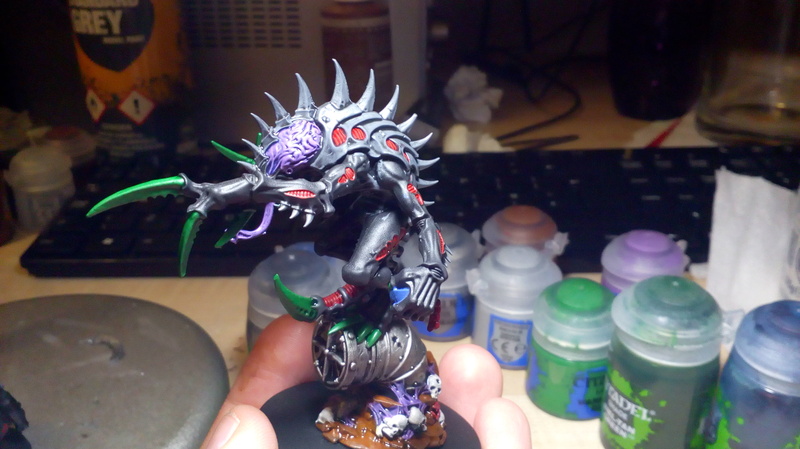 As always pictures below for my fellow cultists. 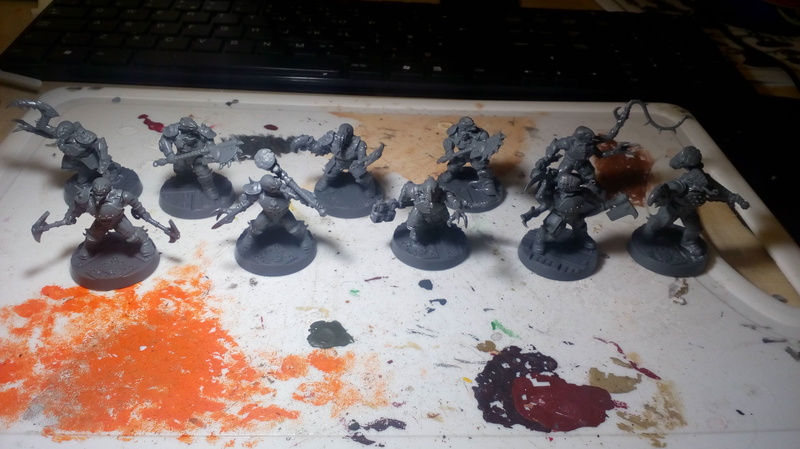 That Patriach is 10/10!, really inspirational, time to glue my boys. It was a cold winter night and an icy wind was blowing down the streets of Manufactorum District 14. The area was deserted, the main shift had ended several hours earlier and most of the factory workers had either gone home or to the local drinking holes to drown their sorrows. But all was not as it seemed. Skulking from shadow to shadow, making efforts not to seen, came six figures. They were clad in long coats, their faces covered by masks and googles, each one had a red band on their right arm. They slowed when they came close to a large warehouse, a building of rockcrete with a rusting corrugated iron roof. Stopping next to a battered side door, the leader of the group held up his hand and the others melted into the darkness. He looked around furtively before knocking four times quickly followed by three times slowly. There was a momentary pause, then the sound of bolts being undone before the door opened a crack and a face appeared. "Your're late Franx, I wasn't sure you were coming"
"Apologies Tanner, are you alone?" "Yeah yeah, you got my payment?" Franx pulled out a crumpled brown envelope from beneath his coat and passed it through the crack. The figure on the other side snatched it and the sound of rustling and mumbled counting under breath could be heard. Then the door swung open and a scrawny man in blue factory overalls was revealed. "Alright Franx, you and your boys get in here quick". The leader made a few quick hand gestures and his followers, emerging from the shadows, followed him inside the warehouse. 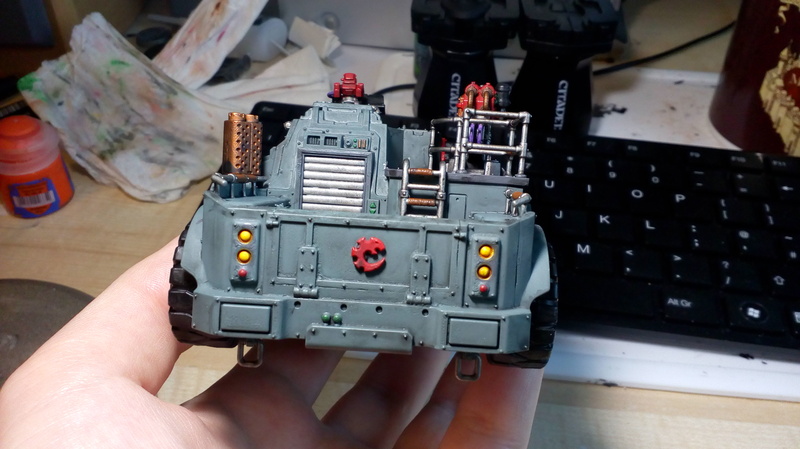 Tanner gestured to a couple of crates laid on the dusty floor "Its all there, one crate of twelve M36 Kantrael lasguns and one crate of twelve Flak Vests, your're welcome to check it." The cultist gave the boxes a cursory glance before replying "No need, you are a true friend of The Brotherhood and you have our thanks." Tanner grinned "You keep paying me this well and I am sure we are gonna be the best of friends." "Indeed, but now it is time for your true payment"
Suddenly, without warning, two of the cultists grabbed Tanner from behind. "Hey what the frak is this!? We had a deal" bawled the man as he was forced to his knees. Franx nodded to his remaining followers and they left the warehouse, returning momentarily with a large black box. The box was similar to a coffin inlaid with green crystal and had a red scorpion tail embossed on its front. The cultist leader turned to the terrified worker "You are very lucky my friend. Thanks to your connections to the manufactorum, you are to be given the chance to join our Brotherhood." Tanner spat on the ground "Frak your cult, y'all a bunch of psychos! I will never join you freaks" Franx shook his head sadly "Im sorry to hear you say that, I had hoped you would join us willingly." Turning round to the black coffin, Franx begun to undo the clasps holding the lid in place. As he did so, he continued to speak "However, it matters not. Like I said you are very lucky, for you are about to receive that all men seek. True enlightenment." As the last clasp was undone, the lid was carefully slid back. From its depths came a creature straight from the stuff of nightmares. Uncoiling like a serpent, the star god stretched to its full height, towering over all present. "Oh frak, oh frak, oh frak" Tanner begun stuttering, he opened his mouth to scream but a hand quickly covered it. A dark patch began to form on the crotch of his blue overalls and the room stank of human fear. 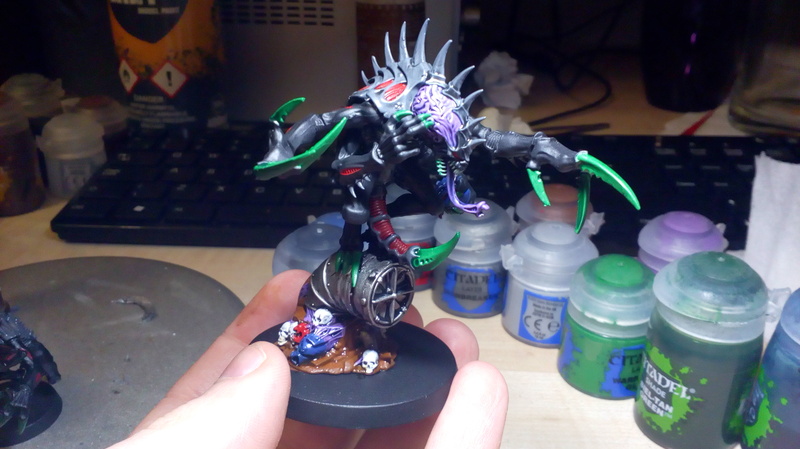 The Genestealer stepped gracefully out of the box and approached the unfortunate man. His eyes bulged and tears streamed from his eyes, snot bubbling from his nose. He desperately tried to look round for help but more hands forced his head forward. As the Purestrain reached Tanner, it opened its mouth and a long tongue slowly emerged. The workman began thrashing, desperately trying to break the hold that binded him, but it was to no avail. Franx began talking again "Do not fear friend. Calm yourself, there is no point in fighting this. Don't panic, you will learn the true meaning of peace" The tongue shot out and struck Tanner in the chest, the mans whole body stiffened and then went limp. An hour later, the group of cultists emerged from the warehouse side door. Between them they manhandled three large boxes. Before he left Franx turned to address the man still stood within the warehouse. " We will be back in two weeks for our next shipment. We will require double what we received today. Will that be a problem?" Tanner smiled back at him, a look of serenity on his face "That should be no problem... Brother". Edited by Mordian Glory, 08 January 2019 - 10:59 PM. 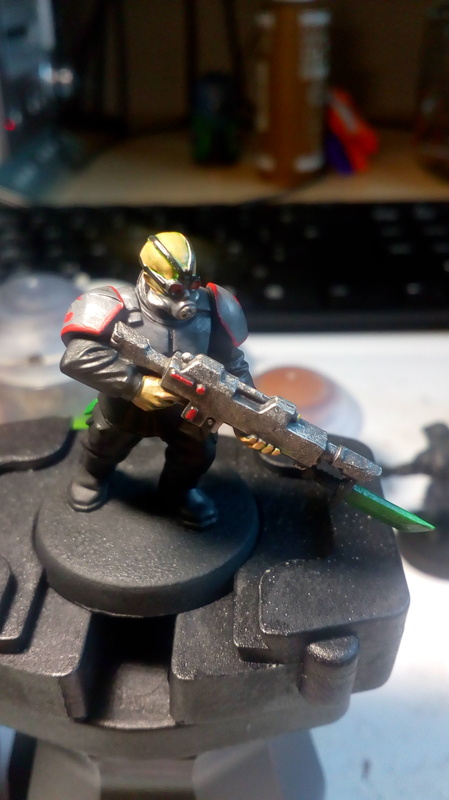 "You see power moves quickly in the Brotherhood..."
More progress has been made on the painting front and my Armoured Neophytes are coming along nicely. 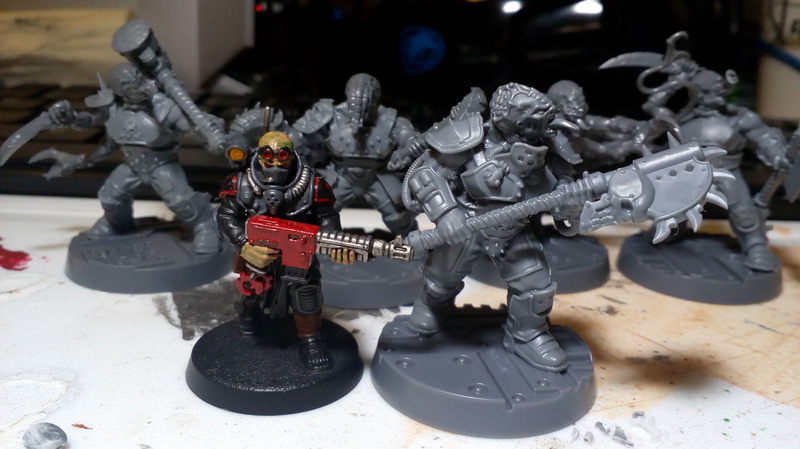 I really like the more professional look of these guys in contrast with the militia look of the Mining Neos. 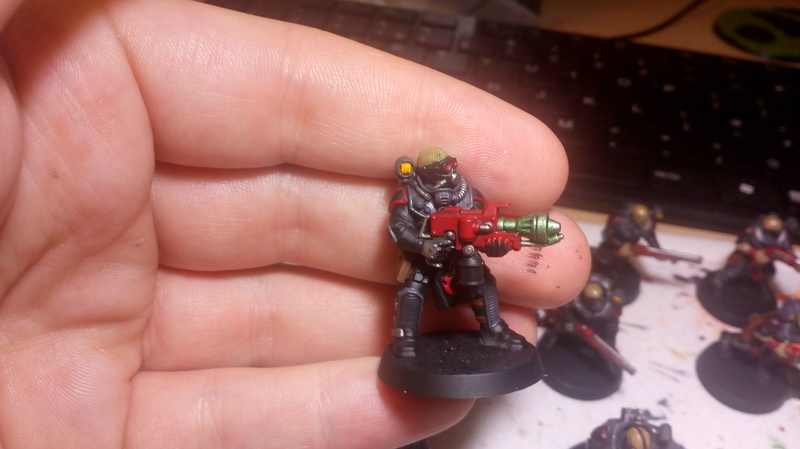 I am thinking that I could use them as either Neophytes or as Brood Brother Imperial Guard. 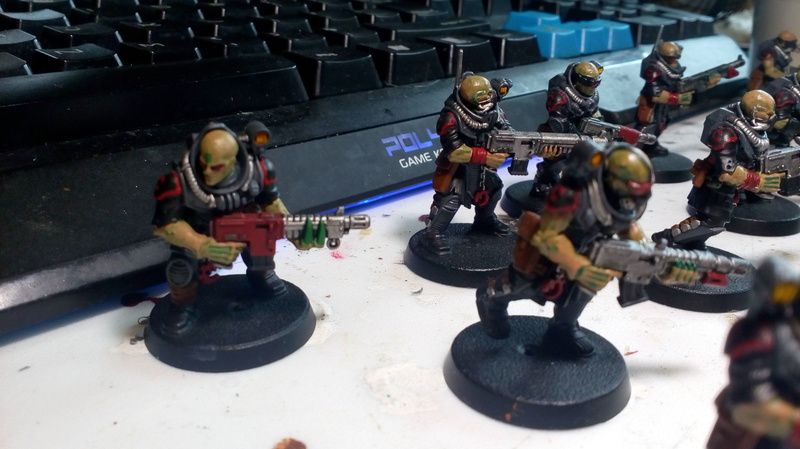 In my fluff these guys are gonna become the "elite" of the cult, charged with guarding key characters and armed with the best equipment. 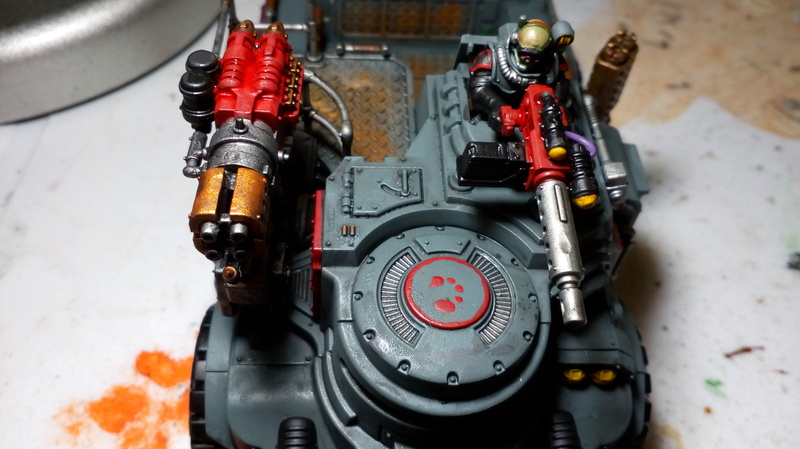 On the table top I am going to represent this with each squad getting a full compliment of Special and Heavy Weapons. 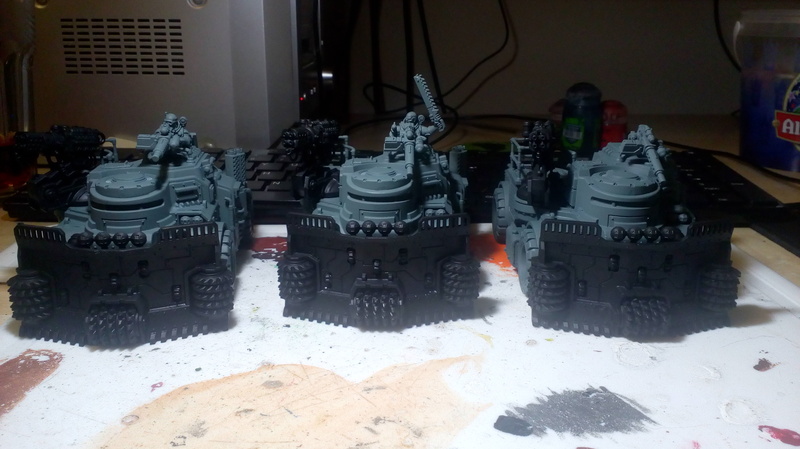 Probably going to be using lots of grenade launchers, Heavy Bolters and Heavy Stubbers. No converted Mining weapons for these chaps! 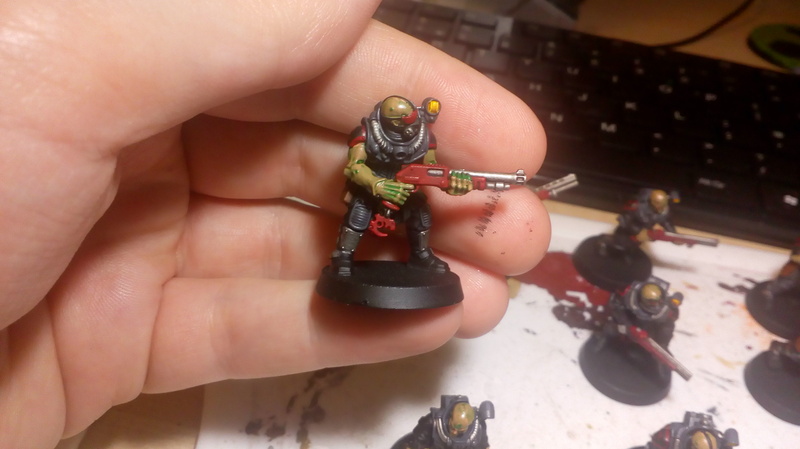 I now have finished 7 out of 12 Cadian Style Cultists and I must say I am loving every minute of it. 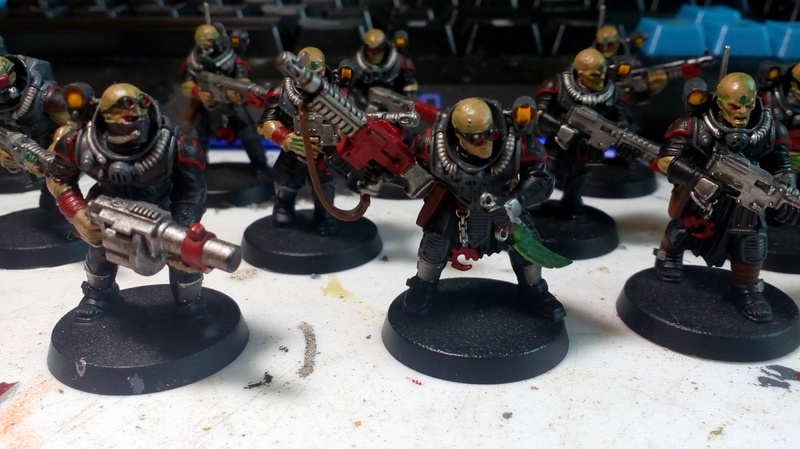 They have reenergised my motivation to paint my cult. 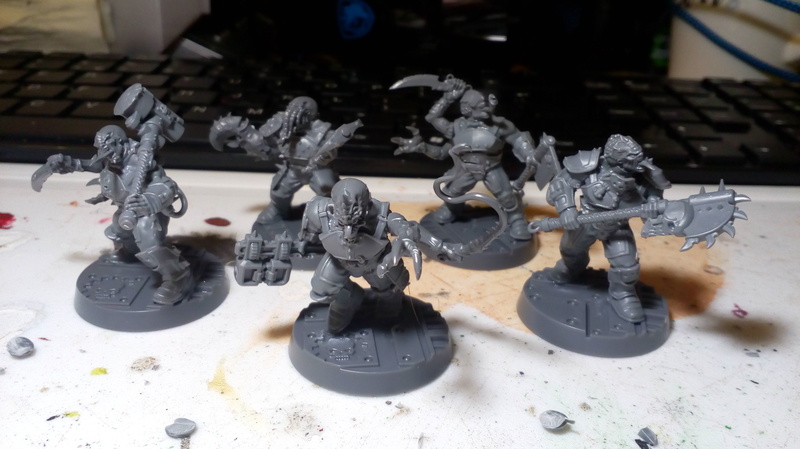 Before xmas I was struggling with the amount of fine detail on the GSC models but these guys are just what I needed. 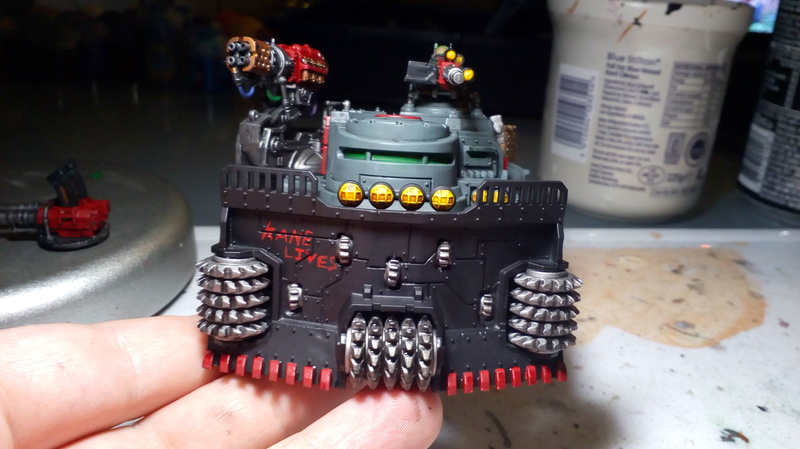 They are simple yet have consistent quality with lots of possibilities for kit bashing! Love it - how are they going to be based?